The Signature Classic float rods from Maver are the new flagship series for 2018. Boasting top quality fittings, classy yet understated graphics and a simply sublime blank make for a dream combination that will satisfy even the most discerning of anglers out there. 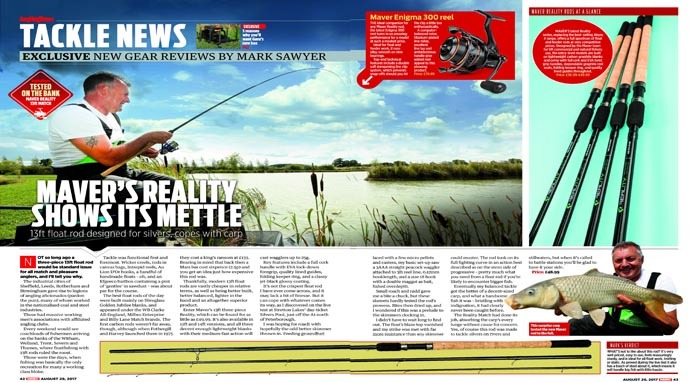 “Maver’s latest pellet waggler and classic float rods will appeal to all who demand the best kit for commerial work”. Review by “IYCF” July 2018. 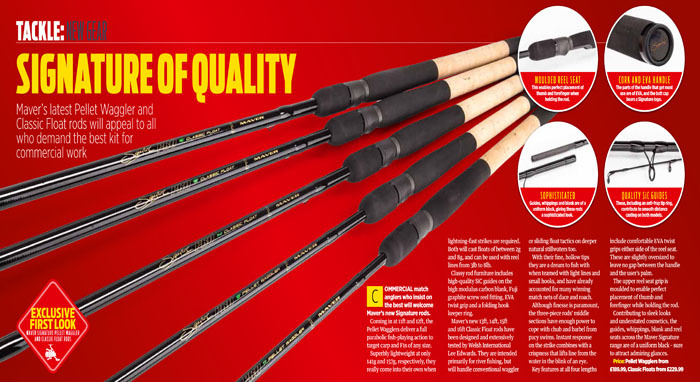 The new MV-R Commercial mini feeder rods from Maver are the perfect tools for anglers fishing venues where short-range casting for carp and F1s is required. 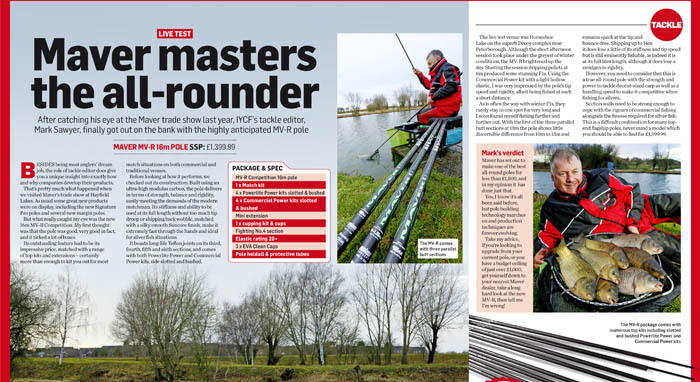 “I found the MV-R mini feeder rods to my liking – in particular, the 8ft model. It cast, as expected, stright as a die, and on a small platform it was nice and easy to get into position. I have handled enough short feeder rods to know that this one has more than enough steel in its backbone to handle proper carp. A weak-willed wobble wand it certainly isn’t so well done Maver”. Review by “IYCF” April 2018. If you’re a fan of short range casting for carp and F1s, take a close look at the MV-R commercial mini feeder rods. 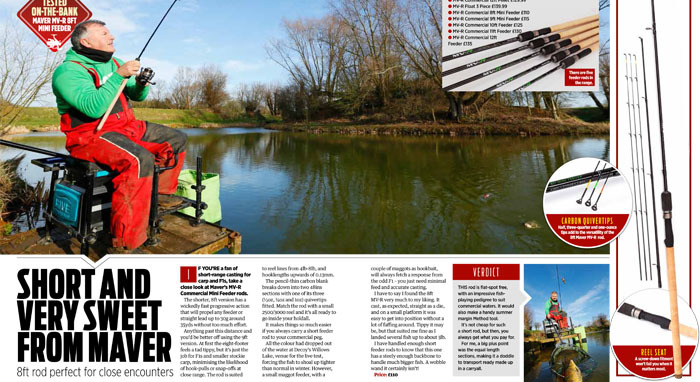 Mark Sawyer review the 8ft 2pc feeder in the February 6th issue of Angling Times. “This rod is flat-spot free with an impressive fish playing pedigree to suit commercial waters. It would also make a handy summer margin method tool. It’s not cheap for such a short rod, but then, you always get what you pay for. For me, a big plus point was the equal length sections, making it a doddle to transport ready made up in a carryall “. Review by “Angling Times” Tuesday 6th February 2018. After catching his eye at the Maver trade show last year, IYCF’s tackle editor, Mark Sawyer, finally got out on the bank with the highly anticipated MV-R pole. 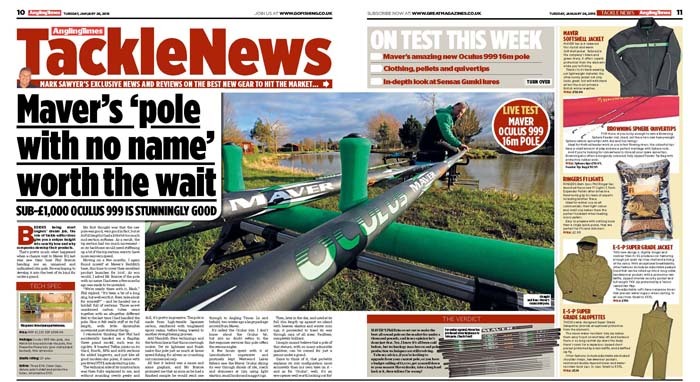 “Maver has set out to make one of the best all-round poles for less than £1,500, and in my opinion it has done just that. Yes, I know it’s all been said before, but pole building technology marches on and production techniques are ever evolving. Take my advice, if you’re looking to upgrade from your current pole, or you have a budget ceiling of just over £1,000, get yourself down to your nearest Maver dealer, take a long hard look at the new MV-R, then tell me I’m wrong! “. Review by “IYCF” February 2018. 13′ float rod designed for silvers, but will cope with carp. carp, and what a handsomesh it was – bristling with indignation, it had clearly never been caught before. The Reality Match had done its job, absorbing the carp’s every lunge without cause for concern. Yes, of course this rod was made to tackle silvers on rivers and stillwaters, but when it’s called to battle stations you’ll be glad to have it by your side. “. Review by “Angling Times” Tuesday 29th August 2017. Touted as a jack of all trade, the Darkside 1 is certainly a master of commercial carping! “Part of the best-selling Darkside family, the Series 1 is a 14.5m model that’s the right length for most fishing situations and, as soon as you pick it up and give the sections a squeeze, you instantly know it won’t let you down. The walls don’t budge an inch and there’s a solid feel to the whole thing when put up to the full length. “. Review by “IYCF” August 2017. Commercial matchmen will love these mini marvels. “The delightful jet black Diamond Feeder gets a huge thumbs up from me. It’s everything you could wish for. It’ll cast a fair distance when you need it to, it’s super accurate at short range and it can be used with a wide choice of weights for tactical flexibility. At just 181g it’s very light, and it’s progressive action combines controlled pulling power with enough softness to make it suitable for lighter reel lines and hooklengths “. Review by “Angling Times” Tuesday 27th June 2017. New flagship pole combines both good looks and amazing performance. “Once again, Maver has come up trumps with its best ever pole. The carbon build is almost frightening in its complexity, but at the end of the day, this is a very serious piece of match fishing equipment that rightly earns a place among the world’s best”. Review by “Angling Times” Tuesday 9th May 2017. 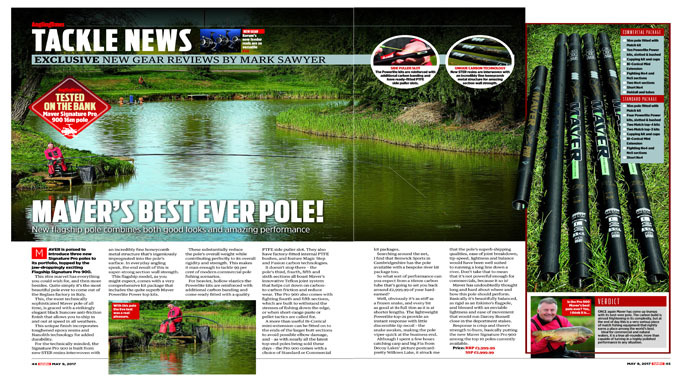 Mark Sawyer reviews the brand new Definition Carp series pole. “Hugely impressive, and with a SSP of under £500 for the 13m model, I have no hesitation in saying that in my opinion, for the price, the Definition is the best all-round power carp pole currently on the market”. 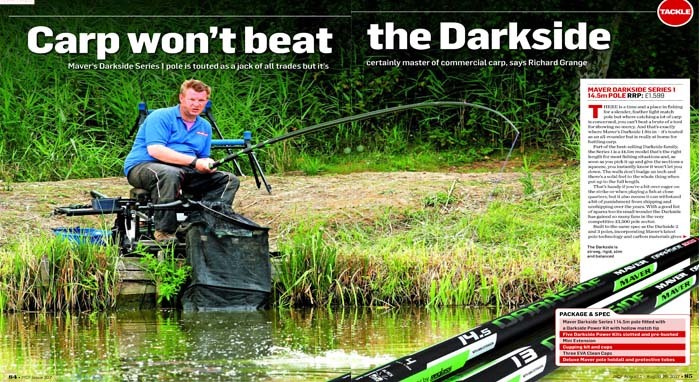 Review by “Angling Times” Tuesday 28th July 2015. Mark Sawyer reviews the brand new Oculus 999 16m pole package and is suitably impressed. Maver set out to make the best all-round pole on the market for under a thousand pounds, and in my opinion, they’ve done just that…get yourself down to your nearest Maver dealer, take a long hard look at it, then tell me I’m wrong”! 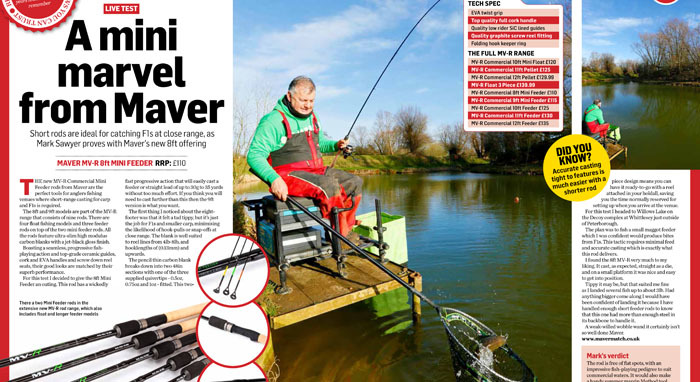 Review by “Angling Times” Tuesday 26th January 2016. Power Pole Pulls Right Back! 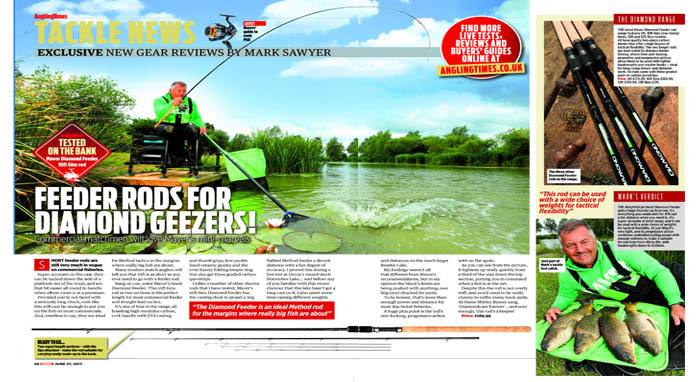 Mark Sawyer reviews the Invincible 215 from Maver. Maver’s latest Invincible lives up to its name and its side puller kits are the best I’ve seen”! 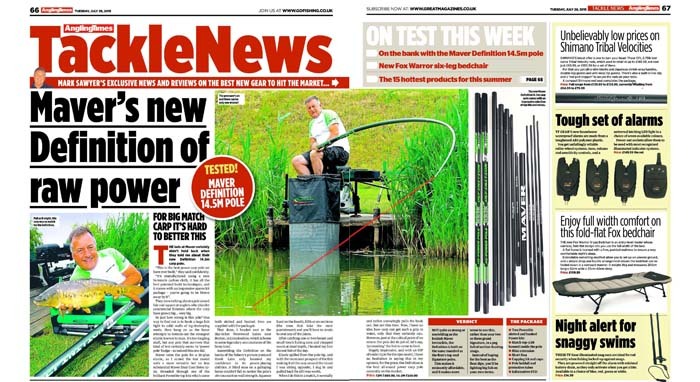 Review by “Angling Times” Tuesday 21st April 2015. 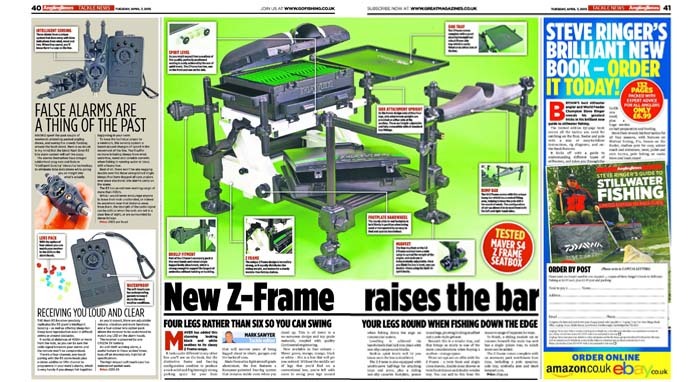 Angling Times columnist, Mark Sawyer, spends some time with the Z-frame seat box. “It looks quite different to any other box you’ll see on the bank, but the distinctive frame and four-leg configuration combine to produce a rock-solid and frighteningly strong unit”. 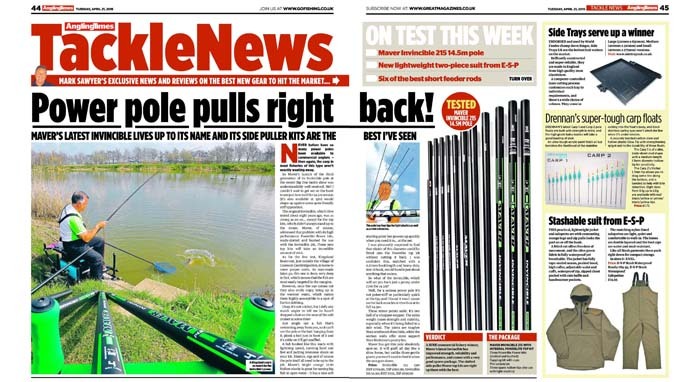 Review by “Angling Times” Tuesday 7th April 2015.